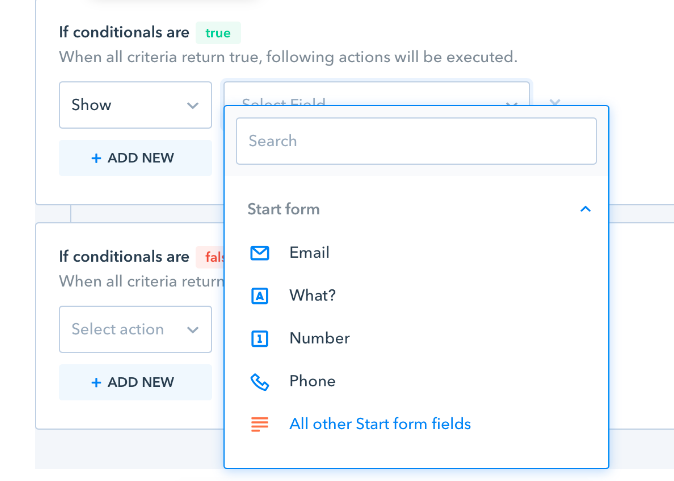 Users in the Business and Enterprise plans can add field conditionals (conditional logic) to their pipe's forms and phases to display or hide other fields according to the value in other fields. Field conditionals can be set up in the pipe's form and phases. To begin setting up a conditional in a phase, simply open a card in the phase you want to setup the conditional in, click on the three dots on the upper right corner and select "Setup conditional". For this article's purposes, let's suppose we have a purchase pipe. In this pipe, whenever a team member requests the purchase of an item with a value that's over a specific amount (in our case, U$D1000), it must be accompanied by purchase approval request. 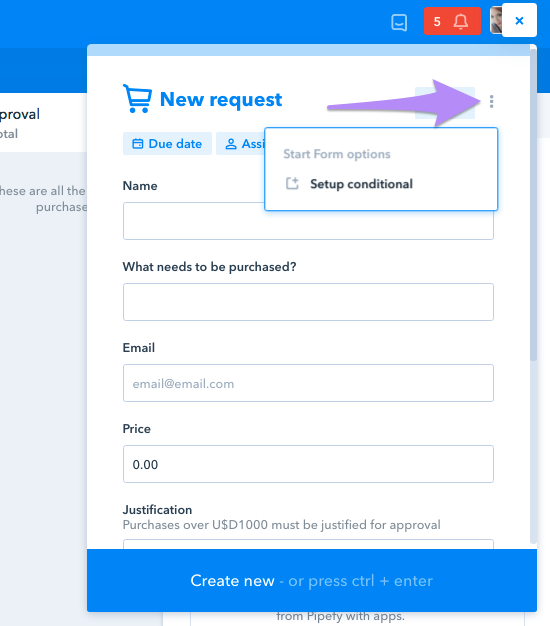 We'll add a field conditional to our pipe's start form so that the "Purchase approval" connection field will only be displayed when the value in the "Price" field os over U$D1000. To do so, we'll begin by opening our pipe's start form and clicking on the three dots in the upper right corner of the screen then on "Setup conditional". After we do that, we'll see a window with a list of field conditionals (if we have any set up) and a button to create a new conditional in our start form. Click the button to begin setting up the conditional. The first step is giving our scenario a name that'll help us identify it later on. We'll then establish the conditional logic. We'll select the field that'll condition the action (in our case, the field price) and determine that we want the value to be greater than 1000. To finish setting up the scenario we'll establish what we want to happen when the condition we created is true (in our case, show the approval request field) and when it's false (hide the approval request field). If you need to show/hide too many fields, you have the option of showing/hiding all other fields in the phase. The fields are displayed grouped by phase, making it easier for you to locate the fields you want to show/hide. Field conditionals can also be used to create more complex scenarios by adding more conditions in the scenario (with and/or option to combine conditionals). The same is true for the action, you can choose to display/hide more fields according to your conditionals (instead of creating a single scenario 'if conditionals are true/false', you can create multiple scenarios for when the field is blank, when the 1st alternative is selected, etc. ).